Turning 50 is truly a monumental milestone in anybody’s life. If someone dear to you is celebrating their 50th year of existence on the planet, we have some absolutely cool messages that you can use in embellishing that incredibly outstanding occasion in their life. Browse through our fine collection below and be spoiled for choice to help make that brand new 50-year-old’s birthday a memorable one! Happy 50th birthday! Did you know that at age 50, you are older than a number of countries in the world? Anyway, have a lovely celebration! Wishing you a super duper 50th birthday celebration! At this age, you have undeniably gained the right to join the old fartdom fraternity. By all accounts, at 50, you’re surely heading towards your expiration date. Enjoy your shelf life while you can. Happy 50th! Happy 50th birthday! If aging was an Olympic sport, you’d surely be the recipient of a gold medal. Happy 50th birthday! Even if you haven’t achieved much in life, you can take solace in the fact that at this age, you surely will never die young. Welcome to the age where you begin losing weight mainly because you want to be healthy not because you want to be skinny. Enjoy age 50 to the max! Dear, on your 50th birthday, may your money multiply with every new wrinkle that appears on your face and skin. In honor of your 50th birthday, I bought you an iron to help you iron out the wrinkles fast appearing on your body. You’re welcome! As we gather here to commemorate your 50th birthday and bid a final farewell to the youthful periods of your life, it’s my prayer that your knees wouldn’t creek too much whenever you walk. Congrats on your 50th birthday! You’re approximately halfway to hitting 100! I guess never in your wildest dreams did you think this would someday happen to you! 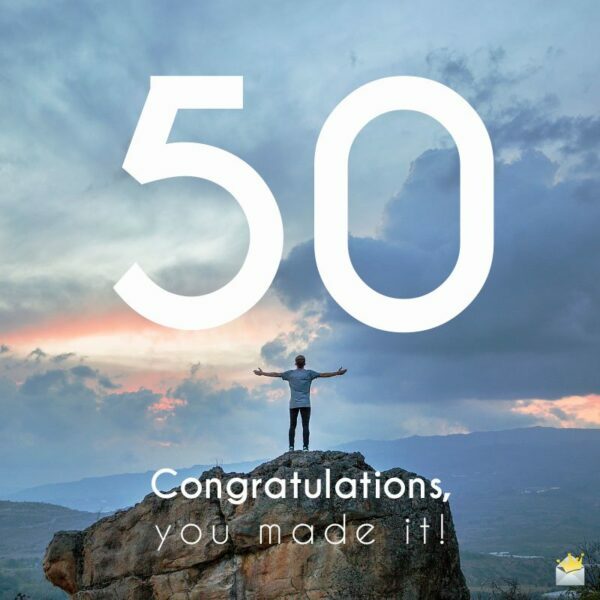 Happy half century! Remember how age 50 seemed so incredibly old to you when you were a teenager? Well, happy 50th birthday, my dear old fart! Happy 50th birthday, Dad! To the world, you may not be perfect, but you’re perfect to me. Enjoy your anniversary to the fullest. Dad, you are our greatest mentor and we know your legacy will live on among your descendants forever. Happy 50th birthday! There’s no father like you in this world, and that is why I am glad I’m your son/daughter. I have the best and most wonderful life ever simply because of you, Dad. Happy 50th birthday! Today’s is a great day because it’s the day my sweet father turns golden 50! Dad, I can’t put into words how grateful and proud I feel whenever someone refers to me as your son/daughter. Happy birthday! Happy 50th birthday to a truly great father and individual. I hope your 50th birthday celebration is the brightest and happiest of all your birthdays so far! Dad, on the great occasion of your 50th birthday, I wish you the best of health, great prosperity and heavenly happiness all the days of your life. Happy 50th birthday to an outstanding father and inspiration. Happy 50th birthday, Dad! Keep on soaring higher! I am totally proud of you. 50. Congratulations, you made it! My best wishes for you, dearest Dad, on your 50th birthday celebration and the numerous years to come. May your life always know happy and prosperous moments. I love you so much. Happy birthday! Wishing my super sweet father an incredibly wonderful 50th birthday and several more absolutely happy and magical years. Love you bunches! I’m truly blessed to be the recipient of the love and care of an outstandingly amazing father like you. Happy 50th birthday to the world’s most awesome father! In my eyes, you’ll always be my angel and inspiration. I love you so much, Dad. Happy 50th birthday! Dad, congrats on your 50th birthday! Wishing you a beautiful day and life filled to the brim with only the things that matter most in this world: love, peace and true joy. I’m certainly blessed to have God’s most special angel as my dear father in this lifetime. Happy 50th birthday, beloved Dad. It is a real joy to work with someone as brilliant as you. Happy 50th birthday, dearest colleague! Hearty congratulations to you on turning awesome 50 this day! May this great milestone bless you with the finest things in life. Have a truly joyful and prosperous life, dear friend and colleague. Happy 50th birthday! It makes me incredibly happy to celebrate this great milestone of your life with you. On your Big Day, may you be blessed with happiness than your world has space to contain. For 50 solid years you have been nothing but a remarkable blessing to all those around you and the world at large. 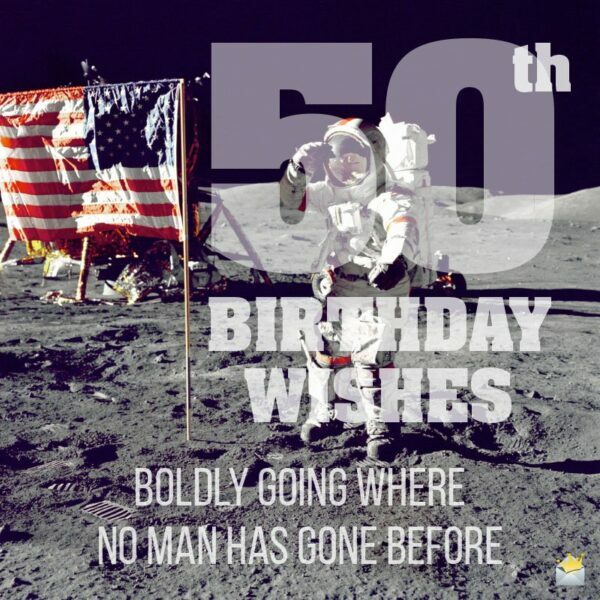 I wish you a sunny and delightful 50th birthday celebration. Happy birthday to one of the youngest and most amazing 50 year old in the world. I hope your 50th birthday is crammed with oceans of happiness. Wishing you a wonderful 50th birthday today and an even more incredibly wonderful year. My dear, as far as colleagues and pals go, you’re absolutely amazing! Happy 50th birthday! Hope this milestone celebration of yours is full of wonderfully unforgettable moments. Wishing a truly wonderful individual an absolutely fabulous 50th birthday celebration. May you never stop being the recipient of God’s most precious blessings. Happy 50th birthday! The golden years of your life have just begun! Enjoy to the fullest every moment that comes with this wonderful chapter of your earthly journey! 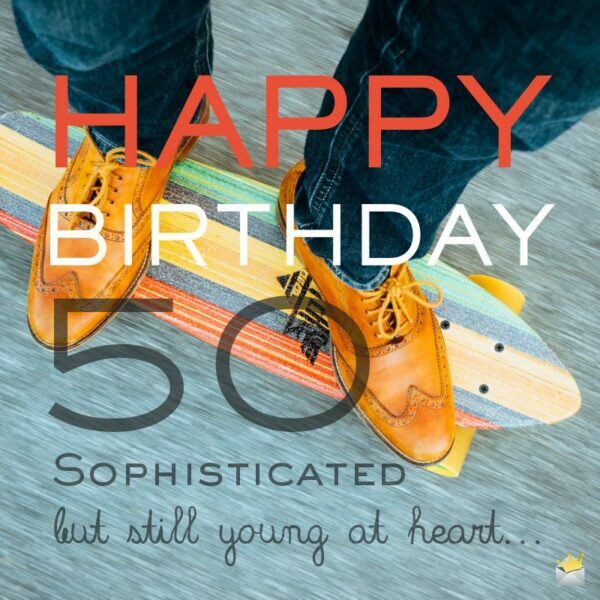 You only get to celebrate being 50 once in a lifetime, so let’s make this amazing day fabulously epic! Happy 50th birthday! I just wanted to be the first colleague of yours to tell you the words “happy 50th birthday”! May every moment of your life as a 50-year-old be full of happiness and good fortune. Today’s an amazing day as it’s your 50th birthday! I’m so glad to share this great blessing of your life with you. It’s a great honor and privilege to know an amazing person like you. As you mark the remarkable occasion of your 50th birthday, may your face always be wreathed in smiles. Dearest, may happiness and mighty mountains of blessings find you on your 50th birthday celebration and every day of your life. Happy birthday! Happy 50th birthday to someone who amazingly gets younger at heart and soul with each new birthday celebration. Happy Birthday: 50. Sophisticated but still young at heart.